(CN) – U.S. Attorney General Jeff Sessions on Friday ordered a zero-tolerance policy on unlawful border crossings, and critics say the Trump administration is manipulating facts to justify draconian policies. Sessions based his direction to U.S. attorneys to prosecute individuals found to have unlawfully crossed the U.S.-Mexico border to the maximum extent of the law on statistics released by the Department of Homeland Security on Thursday that many say are skewed. According to Homeland Security, unlawful border crossings spiked 203 percent in March 2018 when compared with March 2017. Meanwhile, the department said there was a 37 percent increase from February to March this year, the largest month-to-month increase since 2011. “The situation at our southwest border is unacceptable,” Sessions said in a statement. But immigration advocates say the Trump administration is manipulating statistics to make the situation seem worse than it is. John Manley of the American Immigration Lawyers Association said Homeland Security included in its statistics on unlawful border crossings people seeking lawful entry, humanitarian protection and people who have withdrawn their petition for legal entry into the United States. “Someone showing up at a border, going through inspections and either seeking asylum or seeking entry on a current visa is not illegal border crosser,” Manley said. But along with inflating numbers, Manley said the department is selectively using time frames to mislead the public. Other evidence also shows a decrease in migrant flow over the border. The American Immigration Council released a study recently showing detentions for unlawful border crossing during fiscal year 2017 were at their lowest level in the last 45 years. Nevertheless, the Trump administration says additional security and deterrence is needed. Officials point to news reports about a caravan of migrant workers making their way from Honduras, north through Mexico apparently headed for the United States. The Trump administration seeks to deter those workers from entering. “To those who wish to challenge the Trump administration’s commitment to public safety, national security, and the rule of law, I warn you: illegally entering this country will not be rewarded, but will instead be met with the full prosecutorial powers of the Department of Justice,” Sessions said. Earlier this week, Sessions installed new quotas for federal immigration judges in an effort to reduce the backlog in deciding deportation cases. 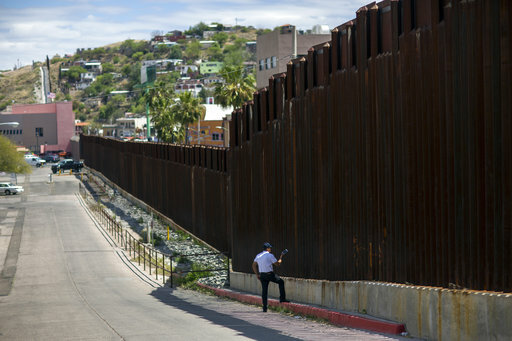 President Donald Trump, who campaigned on reducing unlawful entry into the United States from the south, has paid increasing attention to the issue in recent days. Critics say such rhetoric perpetuates racial stereotypes and the new policies are more based on irrational fear than facts.